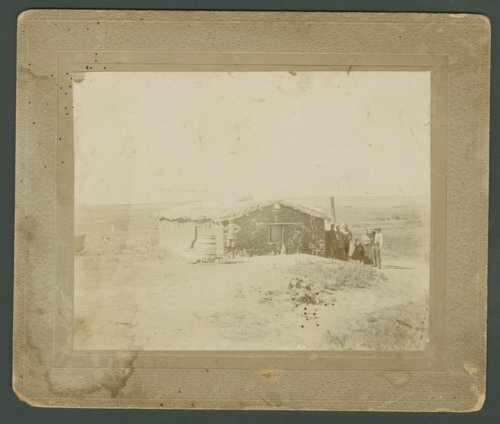 This is a photograph showing the Woods family sod house in Edwards County, Kansas. The people in the photograph are (right to left): D. M. (Deforest Melvern) Morse holding Orpha Morse, Ruth Morse, Florence Morse, and unidentified members of Woods family. The Woods and Morse families lived in Brown Township southeast of Kinsley in Edwards County, Kansas. The 1895 census lists the Wodds family members as J. D. Woods (age 41), Forrender Woods (age 32), O. E. Woods (age 15), S. R. Woods (age 13), Genevia A. Woods (age 11) and H. R. Woods (age 9). The Morse family included D. M. (Deforest Melvern), Ruth, Florence and Orpha.